The case for creating a full functional and devolved Welsh civil service is a strong one, the day to day consequences of a partially devolved and somewhat periodically Wales focused civil service are self evident. As long as a significant percentage of some (but certainly not all) civil service mandarins careers remain understandably focused across the border on Westminster and Whitehall, and remain largely indifferent towards our national aspirations; then to misquote Jawaharhal Nerhu - the civil service in Wales could be described at times as not particularly Welsh, nor particularly civil, nor particularly a service. A unified depoliticised (lets be honest de-labourisation would be no bad thing if we are serious about developing our civic society goes) Wales focused civil service is pretty much a necessity. I would broaden that definition of civil service include our local government staff, NHS and third security admin and technical staff. This would allow people to develop broader careers via secondments, promotions, sideways moves and career placements across the whole of the Welsh public sector. This would be beneficial, help to break down artificial barriers, help avert the dangers of silo thinking and boost our public sector. “The National Assembly for Wales legislated to protect our democratic powers from a power-grab by the Government in Westminster. It demonstrates the contempt that the Conservatives have for the democratic wishes of the people of Wales that they are choosing to challenge the Bill in the Supreme Court, rather than continue to negotiate in good faith to come to an agreement that works for all. “This shows that when it really matters, the Conservatives will not stand up for Wales. Welsh Conservatives in the National Assembly initially voted in favour of my motion calling for a Continuity Bill, but when Wales needed them to challenge their bosses in Westminster, they were happy to capitulate rather than join the fight to save Wales’ devolution settlement. Details from secret trade talks between the Westminster Government and 14 other trade groups have exposed the desperation inside Whitehall and the impact that leaving the Customs Union will have on the economy and consumers. The details emerged after a Freedom of Information request in the United States revealed details of the UK-USA talks. The information reveals a desperate Westminster Government sent 27 members of staff from the Department for International Trade (DIT) and the Department for Exiting the EU (DExEU) with no experience of negotiating trade deals to Washington to negotiate with a 77-strong US delegation which included seasoned trade officials with decades of negotiations under their belts. Details from the agenda reveal that the so-called trade working group with the USA discussed trade strategy, textiles and apparels, regulatory issues, industrial tariffs and agriculture. Despite the Westminster Government down-playing the significance of the controversy over chlorine-washed chicken, the working group spent two hours discussing "agriculture and SPS" (SPS referring to sanitary and phytosanitary trade issues - such as the controversies over chlorine-washed chicken and hormone-reared beef) - longer than any other sector. The information will cause particular concern for the agriculture sector in the UK, and Welsh farmers in particular, whose market face being flooded with cheap, lower quality imports, undercutting their prices. Plaid Cymru says the information confirms the importance of the Customs Union and has urged the Conservatives and the Labour Party to support continued membership of the existing Customs Union. The UK's membership of the Customs Union gives all UK countries access to free trade agreements with more than 60 other countries around the world - the other Customs Union members and other countries with whom the Customs Union has a free trade agreement - negotiated collectively to improve terms. Leaving the Customs Union means losing all current free trade arrangements and negotiating new deals without the benefit of doing so jointly with our partners, inevitably meaning poorer terms for the UK. The Government's own analysis shows that every country in the UK will be worse off if we leave the Customs Union, even if free trade agreements are signed. "This perfectly illustrates why staying in the Customs Union is so important. We already have free trade arrangements with more than 60 countries thanks to our place in the Customs Union - trade agreements that were negotiated collectively, strengthening our hand and maximising the benefits for us from those trade deals. "These details from the American trade group give us a glimpse of our future outside the Customs Union. A weak, inexperienced and desperate group of civil servants trying to strike a trade deal with markets five times bigger than ours, with experienced trade negotiators. It is simply not possible to replicate what we are able to do as part of the Customs Union, on our own. "Clearly some sectors will be sacrificed to ensure others are protected and we need only look at Westminster's every-day priorities to see which sectors are set to lose and which will be protected. Particularly concerning is the Westminster Government's insistence on holding these talks in secret - not just in the USA but with the 14 other trade groups across the world. What are they hiding from us? "This is why Plaid Cymru is adamant that every country in the UK should be involved in these talks, not just England, and that every country should have to sign any deals off before they are implemented, to ensure our own key sectors such as manufacturing and agriculture are protected, not just the City of London. "Westminster's flat out refusal to treat Wales and Scotland as equals alongside England means there is only one option - for the whole of the UK to stay in the Customs Union and to maintain our strong position as a global trading bloc. "Both the Conservatives and the Labour Party must reverse their position and make it clear that we will stay in the existing Customs Union." Reports that Newport Council has got a poor response from the public and business community to its city centre ‘masterplan’ proposals proves Plaid Cymru right, say the party’s Newport group. “The failure of the Council to engage and enthuse people in Newport in its consultation is an indication they are out of touch with the seriousness of the economic problems we face, and are failing to offer any hope to businesses or young people who have to grapple with the reality of our austerity economy”. “Plaid Cymru recommend a bold, ambitious, international response for our city centre masterplan, which included creating stunning iconic 21st century business and residential buildings along Usk Way, supporting a major revamp of our heritage architectural 19th century retail axis along Commercial Street. We proposed a major international fine art and design festival and musuem to attract people to those subjects in our University plus the creation of an international quality ‘sports village’, right on the riverbank area with stakeholders at Rodney Parade “. “We await the Labour Council’s response to these proposals, which would gain a positive response from both the public and business community”. The Plaid Cymru detailed document runs to eight pages, and proposes over 90 recommendations for the city centre, which are bold, imaginative, and international to approach Newport’s economic regeneration. Perhaps we could name it the Bridge of Sighs, after all those if us who have crossed it and left out a sigh every time we got fleeced at the tolls when we crossed it. While the VAT has been removed (which was nice) - we are still getting fleeced (for an as yet indeterminate period) until the tolls are further reduced or entirely removed. Ironically pressure appears to be mounting on the Westminster Government to abandon plans to rename the Severn Bridge the ‘Prince of Wales Bridge’ after 15,000 people signed a petition opposing the move in just over 24 hours. A petition set up by Jamie Matthews after the announcement by the Westminster Government's Welsh Secretary Alun Cairns and had surged to 19,214 signatures by 19.00 today. Opponents of the move remain angry that name change had been imposed on Wales with no prior consultation or even a suggestion that the bridge was being renamed. A series of protests were being planned, the first of these outside Cardiff’s Hen Lyfrgell / Old Library at 2pm on Saturday. Yet another protest on the Severn Bridge has also been mooted by others - it's understandable and fine - but the question might be asked where were you - when the commuters and business people were getting fleeced year in and year out by the unjust and unfair (but regular) toll increases that were imposed on Severn users over the years. 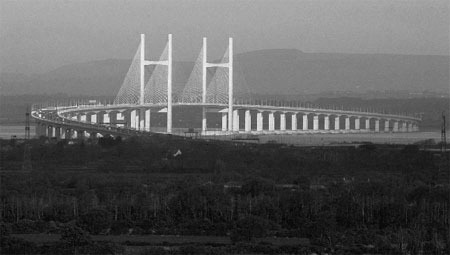 The renaming of the bridge was intended to mark the 60th anniversary of the Queen giving Prince Charles the title of the Prince of Wales when he was nine years old. A number of Labour MPs and AMs have spoken out against the name change. Former Shadow Secretary of State for Wales, MP Paul Flynn, called it a “rather pathetic and desperate stunt”. Cardiff West MP Kevin Brennan suggested calling it ‘Pont Beca’ to remember the toll-gate destroying Rebecca Riots. The Labour in Wales First Minister (branch manger), Carwyn Jones, had been told about the change but had “raised no objections,” the Westminster Government said. No change there then - as the Labour in Wales government (and Labour MPs in Westminster) were pretty mute about the tolls especially when they were in government at Westminster. AN OVERWHELMING INDIFFERENCE OR NOT? While most people are probably fairly indifferent to the suggested new name, the issue as stated by Plaid Cymru leader Leanne Wood is not the royal name it's the fact that it had been imposed on Wales by the Westminster Government with no public consultation at all. This contrasts very poorly with the Queensferry Crossing in Scotland where a consultation (and a vote) was held with more than 35,000 votes being cast. The problem with this is that people in Wales have not been asked, and it never crossed the minds of those who made the decision to even consider for a moment consulting the people of Wales – as people in Scotland were asked when the Queensferry crossing was named. The bottom line is that decisions about Wales should be made in Wales, rather than imposed on us without our consent, but, from a Westminster perspective that dangerous thought may have a whiff of sovereignty lying with the people. From the periphery, which largely depends on where you stand and how you look at the map, a change of economic focus in Wales is long overdue, perhaps ironically Brexit may well provide us a new opportunity. It is clear we cannot go on as we have, our country is literally littered with the tombstone like remnants of failed models of economic development, most of them having failed to deliver long-term economic benefits and more than a few long-term jobs to our people and our communities. What is badly needed is the courage to step away from the over centralised state dependent model of economic development as applied by successive Westminster and Welsh governments. Governments which have consistently failed to deliver beyond the short-term for Wales. With the crutch of EU regional funding about to be kicked away, despite some weak and wobbly promises from Westminster to the contrary, we desperately need some fresh economic thinking. We badly need to find other economic models that can deliver long-term jobs and lasting material benefits to our communities and to our country. We have been over dependent on Westminster or Cardiff Bay waving their magic wand to solve our economic problems, something that is entirely understandable considering the nature of our economic and political history, but simply compounds the error and won’t solve our economic problems or create sustainable jobs. The days of bringing in significant amounts of ‘inward investment’ are probably over, Westminster has better things to spend its money on. Post BREXIT European funding or funding from is Westminster on anything like its previous scale is probably not going to happen. Lets be honest ‘The Union’ as it has been, even with devolution has failed to deliver for Wales, certainly as far as it is concerned the current Welsh Labour government is fresh out of ideas. We need indigenous home grown businesses (small, medium and large scale) which will put down roots and stick around when economic times are tough rather than pulling up sticks and bugging out when the grant money runs out and be more able to resist being hovered up by multi nationals. We need to develop small to medium sized enterprises or local co-operative industries that could provide medium to long-term sustainable job opportunities. The co-operative model works well in both Ireland and in the Basque country, there is no reason why it should not work well here. The Basque cooperative model, as personified by Mondragon co-operative suggests what can be accomplished. If we are to grow local businesses and local jobs we are going to have to create a real Bank of Wales, perhaps using the German Sparkasse and Landesbanken model. For too long far too many small and medium sized businesses in our country have been denied credit by banks and this has prevented the growth of our private sector. Our over centralised dividend driven pretty much rootless London based banking model that has been followed in the UK is incapable, indifferent or simply unwilling to deliver or support economic development in our country. in Germany, the Sparkasse and Landesbanken operate on a geographical basis, and have developed special expertise in the local industries so that they are better equipped to make investment decisions and should offer a real alternative. Adam Price (Plaid Cymru AM/AC) has previously noted, “there are some great contemporary examples of Welsh co-operation at work. Time-banking was a great idea developed by American Edgar Cahn, but it’s in the south Wales Valleys that it’s taken deepest root. Antur Aelhaiarn, the UK’s first community co-operative, is still going strong after thirty years. Glas Cymru is such a unique example of utility-based mutualism that Harvard has made it a case study. But these wonderful examples are so often beacons without bridges, lone successes that have never scaled into a full-flung Mondragon-like movement”. Mondragon a collective of over 250 companies and organisations mostly based in the Basque Country has proven to be one of the more resilient economic success stories in recession-hit Spain. The Basque co-operative may well be the world's largest worker co-operative, it has certainly assisted the Basque economy to try and resist the worst ravages of the recession in Spain. The company was established in 1956, in the province of Gipuzkoa; with a business philosophy built around co-operation, participation, social responsibility and innovation. It began small, with a group of workers in a disused factory, literally using hand tools and sheet metal to make oil-fired heating and cooking stoves. The Cooperative competes on international markets using democratic methods within its business organisation, helps to create jobs, and is committed to the human and professional development of its workers and pledges to development with its social environment. Some parts of the co-operative are wholly owned, others are run as joint venture operations. Over 11,000 people work abroad in 9 delegations and 128 production subsidiaries. The group’s innovative drive is channelled into 15 technology centres and into the cooperatives themselves, participating in research and technology development projects at the national and international level. The Mondragon group’s credit union (Caja Laboral) practically ended up effectively as one of Spain’s largest banks and has recovered from an initial 75% reduction in its profitability, unlike the other Spanish banks, which are still struggling. Co-operative members as equal co-owners of their own workplaces enjoy job security and individual capital holdings, with an equal sharing of profits on a proportionate basis and an equal ‘one-member one vote’ say in the way their enterprises are run. Pay within the cooperatives is strictly egalitarian, with the highest rates payable other than in exceptional circumstances being refreshingly no more than six and a half times the lowest rate. The Basque country has Spain’s highest GDP per capita, its richer than even Catalonia and Wales is the poorest nation in the British Isles, and in northwestern Europe. We in Wales have much to learn from the example of Mondragon and its methods when it comes generating and retaining sustainable jobs, remaining poorer west Britons is not a serious option. There is no reason why the co-operative approach combined with a rich mix of small to medium sized enterprises cannot be used to bring in a community focused upward economic slow burn approach to economic development, something that will not just provide local jobs but real community beneficial sustainable developments which can transform our communities and fundamentally boost our country’s economic potential. A former journalist, and a former IT Professional, I have been actively involved in pretty much every Plaid campaign in the South East one way or another since 1998. I am Plaid Cymru - The Party of Wales Prospective Parliamentary Candidate for Newport West constituency. I am interested in social justice, the growing problem of a lack of affordable housing, energy independence, land tenure, public access, law and order, equal pay, integrated public transport, our economy, the consequences of the former war on terror and enduring threats to civil liberties. I have a passing interest in the consequences of Peak Everything. Amongst my other interests are Archaeology, history, politics not to mention Newport County and the Gwent Dragons. Any blog postings contain only my personal views and are published in an entirely personal capacity.